Search Results for "soccer goalkeeper"
Young football goalkeeper concending a goal from opposing team during soccer match. Soccer goalie allows striker to score a goal during football game. 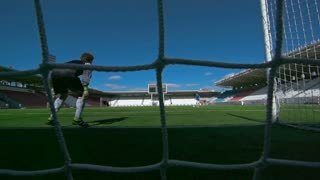 Skillful young soccer goalkeeper making penalty save during football match. Striker taking penalty kick and goalie diving to save goal from scoring during football match on the field. Stabilized shot. Young soccer goalkeeper making save after kick during football game on sports field. Goalkeeper blocking soccer ball during training on football pitch. Young soccer goalie making save after penalty kick during football game on sports field. 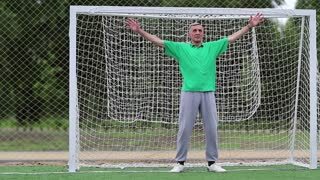 Handsome striker executing penalty kick and goalkeeper blocking soccer ball during training on football pitch. Soccer goalkeeper save (punch). POV of keeper. Football youth playing. On Stadium Attacker Kicks the Ball and Scores the Goal, Soccer Goalkeeper Tries to Defend Goals but Jumps and Fails to Catch the Ball. In Slow Motion. Young soccer goalie saving goal during football training match. Skillful striker dribbling , getting past defender and shooting on goal while playing football match on sports field. Stabilized shot.